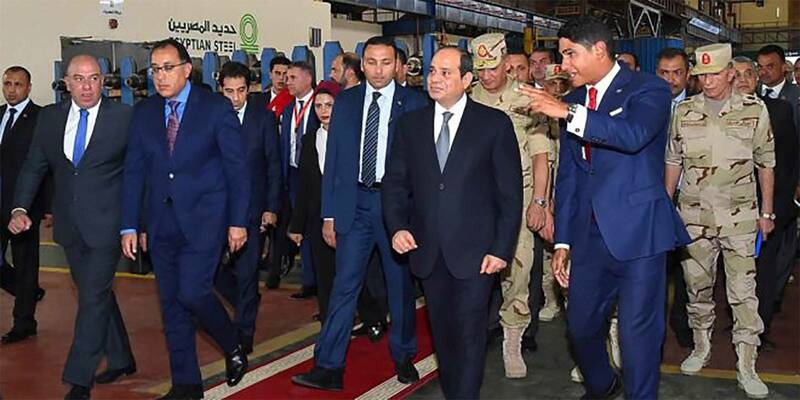 His excellency, Abdel Fattah el-Sisi, President of Egypt visited the Beni Suef factory where he learned first-hand about the state-of-the-art technology and solutions designed and implemented by Danieli Group. We are talking about the MicroMill steel plant developed for the world’s highest productivity, 75 tph in a single, endless line. It was originally designed to produce 130-mm square billets, then extended to cast 165-mm square billets at speeds exceeding 6.0 mpm, enhancing productivity and plant capacity for specific market needs. The target hourly production of 75 tph was reached and even exceeded, up to a maximum of 80 tph (6.3 mpm conticaster speed and rolling mill entry speed), within three months from the first heat, confirming the soundness of the whole process. The host, chairman of the board of the Egyptian Steel Group, Ahmed Abou Hashima gave the tour and emphasized that all the product lines were built with the international standards. This is a first steel plant in Upper Egypt, also known as The Egyptian Gate for Development, with an important role in social and economic progress. It is a result of partnership, contribution and commitment. A combination of a great idea and a good business strategy. Another inspiring story of success!